In the story of Ruth we discover that when she returned from Moab she was once again received as a member of the community. Isn’t that interesting since God had commanded the Israelites to have nothing to do with the Moabites (Deut. 23:3-6). There is certainly a hidden story of forgiveness here. Ruth and Naomi could have been rejected, ostracized, and asked to leave the community, but that didn’t happen. Instead, a leading member of the community (Bethlehem) married Ruth (the Moabitess) and from that union came Salmon who fathered Jesse who fathered David…Even though God had clearly defined the rules for inhabiting with or aiding the Moabites He chose an obvious rule breaker (Boaz) to continue the family line toward Jesus. He already knew Jesus’ purpose (to seek and save the lost) and planted both the lost and the Redeemed (His chosen people, Israel) in it. 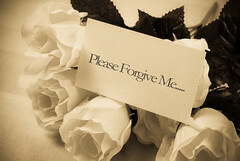 This entry was posted in David, Forgiveness, GOD, Personal Growth and tagged Bethlehem, forgiveness, God, Ruth by Marie. Bookmark the permalink.